Look at the little blobby things! Here's the pitch: you're an ambulatory mound of jelly, see, and your partner is also an ambulatory mound of jelly. You can both change sizes, but whenever one character changes mass, he adds/removes mass from the other. 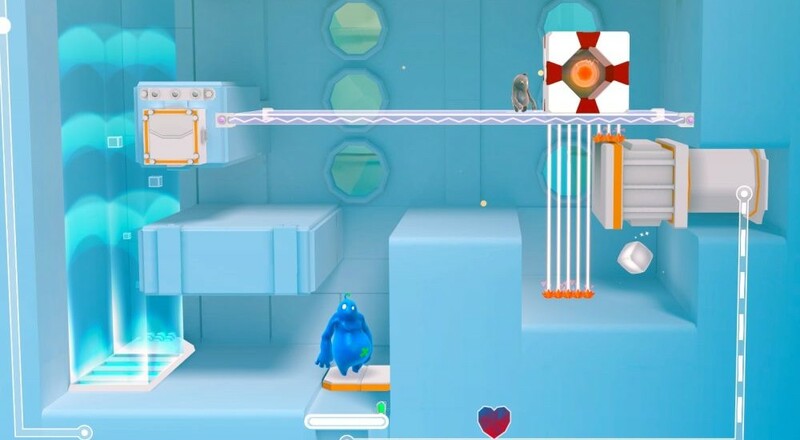 Sounds like boring science stuff, but really it's Shift Happens, a couch co-op puzzle platformer just released on Steam Early Access by Klonk Games. The little jelly tubs Bismo and Plom can do what most puzzle platform stars can do, including jumping, grabbing things, and shoving blocks around. The twist in Shift Happens is that size matters, meaning the big dude has to push the big blocks around while smalls squeezes into tiny spaces and makes the long leaps. Characters can toss each other around, too, and certain switches require more weight to activate. Swap sizes back and forth as you work both characters towards the exit. If Bismo or Plom dies the other can resurrect them, just make sure one character is safe and you'll stay in the game. Shift Happens focuses its co-op efforts on local couch play designed to capture that core essence of cooperative puzzle solving. You know, the old "help your buddy out so he can help you later but maybe you'll splat him against an electric barrier from time because, you know, friendship". Level design emphasizes these simple but satisfying situations with things like co-op keys that require both players to stay alive and stay in close proximity to unlock nearby doors. Plenty of challenge, and plenty of opportunity to test your co-op skills. Shift Happens supports two player local co-op along with a solo mode that lets players switch between characters. Co-op is a thousand times smoother and better than single player, so grab a friend if at all possible. The Early Access version includes a beta version of online co-op, so if all goes well, we can swap jelly mass with non-local friends in the full release. Now that's science! Page created in 1.7206 seconds.